Home > FAQs > Global > Renewals and Transfers > Renew Your Contract > How do I renew my plan with Direct Energy? You can renew your existing Direct Energy service online quite easily. This can be done up to 60 days before your fixed-rate plan contract is set to expire. Direct Energy will contact you by mail, e-mail, and/or Online Account Manager messaging when you are eligible for renewal. 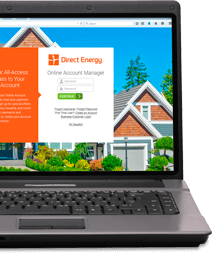 Log into your Direct Energy Online Account Manager with your User Name and Password. Hover over the "Account Management" icon in the top navigation bard? and click the Renew link. You will be presented with a range of plan options and the current rates for those plans in your area. You will be able to view information for the plans available to you to learn more about each plan. When you find the plan you like, click the "Renew" link and follow the instructions. Please be advised that you are not renewing with your current rate and plan. You are renewing your service agreement with Direct Energy, while choosing a new plan and rate. You can renew with your current plan, but that rate most likely has changed, due to energy market demand. If you are not able to process the renewal online, or if you do not see the "Renew" link or the plan option you would prefer, please call Customer Service at 1-855-461-1926 so that a representative can assist you with your renewal.